Leeds-based Emsleys Solicitors has welcomed its newest team member, Dolly the dog, to its Wills and Probate department. 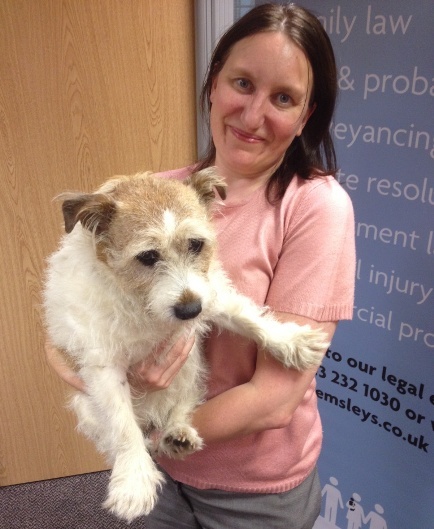 Dolly the Jack Russell joins Emsleys after long-standing client, George Joyner died, leaving Dolly in the firm’s care. Dolly, who brings more than 13 years’ expertise in fetch, rolling over and chasing the postman, will be working closely with Catherine Murray in the wills and probate team, after she volunteered to take her on as an apprentice. “The sensitive and personal nature of the work that we do in the Wills team means we become very close to our clients, and many of our clients come to us for many years. “We’re delighted to welcome Dolly into our family; my 13 year old daughter Beth is particularly happy. “We’re big animal lovers and have been considering adopting a rescue dog for some time. When we heard Dolly had been left in Emsleys’ care, it seemed like kismet.